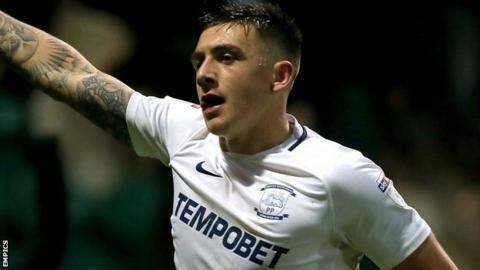 Jordan Hugill scored the only goal of the game as Preston beat promotion-chasing Sheffield United at Deepdale. Preston had the better first-half chances, with Callum Robinson having a shot saved and Paul Gallagher hitting the bar with a free-kick. Hugill gave the hosts a deserved lead when he volleyed in Robinson's delivery from the centre of the box. The Blades improved after falling behind but were unable to test keeper Chris Maxwell in the closing stages. Chris Wilder's side have now lost three successive games to slip away from the automatic promotion places, but they remain inside the top six in their first season following promotion from League One. Preston, meanwhile, have won three of their past four games and are only two points behind the Blades in ninth place. The hosts' only concern from the game will be the fitness of full-back Darnell Fisher, who was replaced in the first-half after picking up a leg injury. "It's been a good spell for us. We've come up against a lot of different challenges so we are delighted with what we have done. "Sheffield United are a really difficult team to play against. I felt at half-time we hadn't moved the ball well enough and a couple of individuals could give a bit more and they gave us that second half, which is why we won the game. "We have a plan A, B, C and D, and the players can slip into different shapes quite easily. I have a young clever squad who are hungry and want to learn." "I don't like the spike that's appeared in the team over the last few weeks. I don't enjoy it. I am one for a consistent approach and performances and we are not getting it. "I think some of them may have taken their eye off the ball a little bit. If that's the case they (had) better get ready for the consequences of taking their eye off the ball. "There have been a lot of plaudits gone to the club and to the players and the staff, so we have to find an answer. Whether that's personnel or my attitude towards them, we have to find a way." Match ends, Preston North End 1, Sheffield United 0. Second Half ends, Preston North End 1, Sheffield United 0. Attempt missed. Jack O'Connell (Sheffield United) left footed shot from outside the box is high and wide to the right. Assisted by Regan Slater. Corner, Preston North End. Conceded by Richard Stearman. Attempt blocked. Jordan Hugill (Preston North End) right footed shot from outside the box is blocked. Assisted by Ben Pearson. Attempt missed. Josh Harrop (Preston North End) right footed shot from outside the box is high and wide to the right. Assisted by Daniel Johnson. Hand ball by Leon Clarke (Sheffield United). Substitution, Preston North End. Josh Harrop replaces Callum Robinson. Substitution, Sheffield United. Regan Slater replaces Samir Carruthers. Corner, Sheffield United. Conceded by Tom Clarke. Substitution, Sheffield United. Clayton Donaldson replaces Cameron Carter-Vickers. Kevin O'Connor (Preston North End) wins a free kick in the defensive half. Attempt saved. Callum Robinson (Preston North End) right footed shot from outside the box is saved in the top centre of the goal. Assisted by Daniel Johnson. Goal! Preston North End 1, Sheffield United 0. Jordan Hugill (Preston North End) right footed shot from the centre of the box to the centre of the goal. Assisted by Callum Robinson. Substitution, Sheffield United. Daniel Lafferty replaces George Baldock. Corner, Preston North End. Conceded by Samir Carruthers. Attempt blocked. Daniel Johnson (Preston North End) left footed shot from outside the box is blocked. Assisted by Callum Robinson. Attempt missed. Callum Robinson (Preston North End) left footed shot from the left side of the box misses to the right. Assisted by Tom Barkhuizen following a fast break.